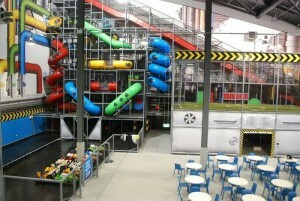 The Play Factore indoor play centre located next to the Trafford Centre, part of the Chill Factore Snow Centre in Manchester was officially opened to the public at Easter 2012. Play Factore, is the UK’s largest indoor play centre at over 26,000 sq ft of space for children of all ages, with what is considered to be the tallest indoor play frame in the World at over 15m high with a 40m long astra slide. There is also a laser tag arena, aerial zip wire, electric go karts, interactive activity area plus a games arcade should keep the children entertained for hours. The Centre should be a popular venue for kids celebrations with four contemporary and fun theme party rooms. Play Factore have also placed a great emphasis on our food and drink, with an Italian Coffee shop and authentic neopolitan pizzas from a wood burning oven. The Play Centre was Project Managed by CUBE Property Services Ltd, Internal play equipment and attractions by SPI-Play and built by Amspec Design & Build. Contact www.playfactore.com for more information. Print article This entry was posted by Neil Price on April 23, 2012 at 12:36 pm, and is filed under Sports & Leisure. Follow any responses to this post through RSS 2.0. Both comments and pings are currently closed.